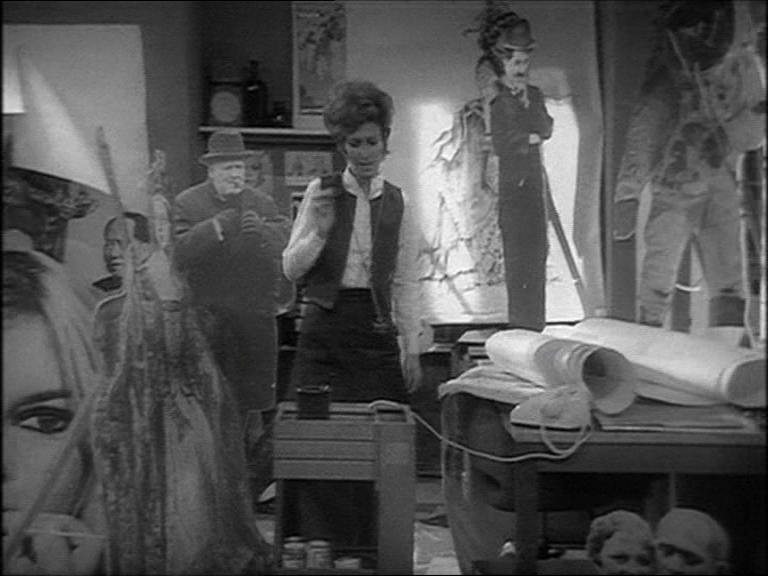 ‘Paul Temple: The Guilty Must Die’ (BBC1, 4 August 1971) Douglas Camfield’s characteristic mastery of depth of field is on display in Ros Drinkwater’s pop art studio. Just imagine what this must have looked like in the original colour! The similarities in the formats of the two shows are striking; both series derived from long-running popular sources in other media, and presented the adventures of a globetrotting gentleman amateur detective, righting wrongs and solving crimes for no reason of reward beyond the hero’s own inherent chivalry. Before reaching British television screens in 1969, Francis Durbridge’s creation had already been heard on the radio and read about in novels since the thirties, been made into films in the forties, and then been adapted into an immensely popular radio series in Germany. This German success was crucial to the form that the inevitable television version of Paul Temple eventually took. With the stories being as popular abroad as at home, a Paul Temple series was likely to gather strong sales overseas. After a conventionally produced first series (none of which survives) a canny BBC Enterprises took advantage of German interest, and from then on Paul Temple became the BBC’s first international drama co-production, financed and filmed in association with Taurus Films GMBH of Munich. The resulting shows showed off their higher budget by incorporating extensive filming in exotic and glamorous European locations such as beaches and ski resorts, shot on cinematic 35mm film, before returning back to Television Centre to record the interiors on videotape. The series might have only run for two years, but had a very high turnover of production, churning out 64 episodes, with the BBC transferring producer Derrick Sherwin away from Doctor Who to oversee the demanding show at short notice – the effect on Who being the main reason that Paul Temple is remembered these days. Three years ago, Acorn released the eleven surviving colour episodes of Paul Temple on DVD, and a rum and disconcertingly unfamiliar type of programme it turned out to be when watched. The sense of disconnection between film and studio that viewers too young to have grown up with the convention often feel when watching old television is felt even by TV swots such as myself when Paul Temple switches back and forth between attempted James Bond-style glamour in Istanbul bazaars and a Wood Green interiors. Perhaps a series with a stronger sense of character and reason for existing might have been able to overcome this handicap of an oddly juxtaposed style, but Paul Temple’s major flaw lay in its insipid generic hero. Paul Temple turned out to be a man who it was very hard to care about or find interesting. He’s a successful thriller writer – as demonstrated by his complaining about his publisher and deadlines at the beginning of each episode – whose emotional involvement with the alarming situations that he faces varies between mild amusement and mild exasperation. Francis Matthews’ performance as Temple tried to convey this as a suave and admirable sang-froid, but the thinness of the material that he had to work with meant that he really came over as a detective who’s bored with his adventures. Ros Drinkwater, as his wife and partner in crime-solving, Steve, fared only slightly better, as at least the plots often required her to flirt with villains and dash about the place in a different natty designer trouser suit in each episode. The intention behind this couple was that the husband and wife shared brittle and ironic sparring dialogue with each other, a purpose generally sunk by this dialogue never quite managing to be funny. The original Acorn box set missed out the five episodes that only survive on monochrome 16mm prints, an omission rectified by this second collection. Seeing these particular shows in black and white doesn’t make as much difference as you might expect, as they happen to be the final five episodes of Paul Temple when resources for overseas locations had run out, and the closest thing we get to international glamour is confined to some stock footage of an Irish race meeting, so you’re not left feeling deprived of any diverting colourfulness that you might be missing out on. Seeing these episodes is an instructive lesson in the sort of things that reach the screen when a programme ends its run, limping exhaustedly towards completion. In one edition Francis Matthews is clearly indisposed and George Sewell steps in to do the necessary legwork to solve the crime, aided by three brief appearances of Paul Temple in filmed inserts. A couple of rather risky scripts reach production, the sort of stories that would have stayed in the filing cabinet if there was other material left to work with. These two stories aren’t necessarily the best of Paul Temple, but they do attempt to do something more interesting than the usual whodunit fare. John Wiles’ ‘Long Ride to Red Gap’ concerns a Surrey approved school, where a Lord of the Flies-style tribe of delinquent boys run riot around their drunken headmaster (Kevin Stoney) and terrorise the outskirts of Guildford, stealing dynamite and causing cars to crash while dressed as Native Americans. Another attempt at social commentary can be found in the final episode, ‘Critics, Yes! But this is Ridiculous!’ in which a Scottish holiday for Paul and Steve is disrupted by murderous goings on at a hippy commune. The suspicious locals – who perhaps inevitably include Angus Lennie – are appalled by the scandalous goings-on on their doorstep (“They’re dope fiends an’ layabouts! Aye, she used to be a nice girl until she went awa’ to that university”), while Temple’s attempts to intervene are met with hostility by the hippies (“You have bad vibrations, man”). A young Maurice Roeves plays the thankless part of the charismatic cult leader, less Charles Manson than George Best in a kaftan. This entry was posted in Series and tagged Paul Temple. Bookmark the permalink.